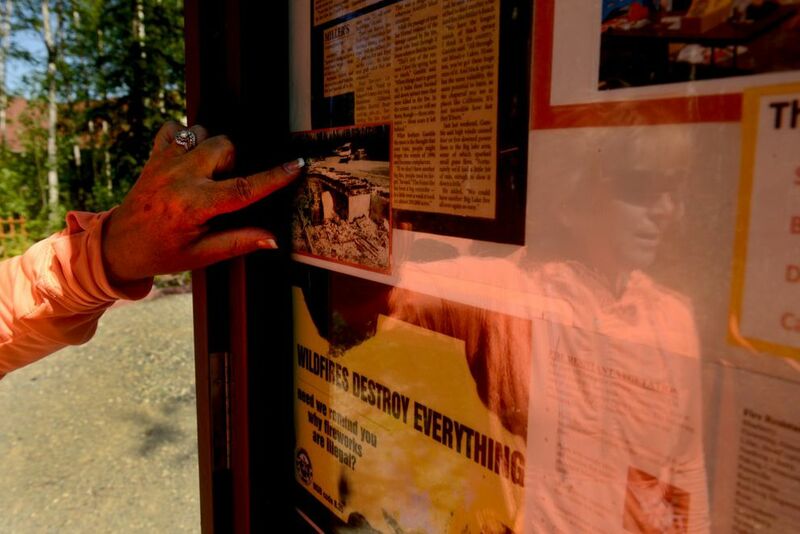 BIG LAKE — Alaska's most destructive blaze happened 20 years ago, but the legacy of Millers Fire survives in still-vivid stories and a changed community. The tales of loss and self-sufficiency, of destruction and regrowth, are emerging again as Big Lake and Houston residents get ready for a block party starting at 11 a.m. Saturday to mark the fire's two-decade anniversary. Anyone who lived through Millers Reach at Big Lake has a memory. The stranger who begged rescuers in a boat to get her baby to safety without her. The neighbors who defended hand-built homes with garden hoses or doused spot fires by barge as fire whirled through the air and black spruce exploded like bombs. And the fire crews who faced the inferno as it roared to life on the afternoon of June 3, 1996. "You could feel the heat — it was like a blast furnace on you," said Bill Gamble, Big Lake fire chief at the time and now the Matanuska-Susitna Borough's top emergency official. "The flames were so high they were almost going over the top of us." The 37,300-acre fire ultimately consumed 454 structures, according to a borough after-action report. The Alaska Division of Forestry later revised that figure to 344 structures, according to borough spokesperson Patty Sullivan. It cost $16.5 million to fight and caused more than $15 million in commercial and private property loss, according to the report, which described the "reasonably certain" cause as fireworks. A definitive cause was never established. Twenty years later, the scars still show on blackened birch and skeletal spruce, but Big Lake is a different place. 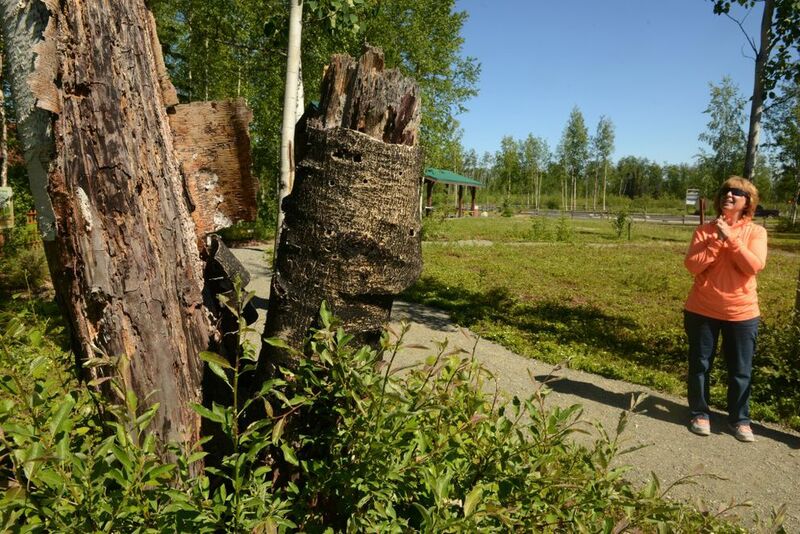 The community has grown from 1,500 permanent residents in 1990 to about 4,000, from a party spot and recreational haven for Anchorage to a place with its own identity, despite a few failed bids at incorporation. Many of the weekenders who lost cabins in Millers Reach rebuilt bigger and moved to the lake full-time. "We really became a stronger, better community because of that fire," said Dan Mayfield, who represents Big Lake on the Mat-Su Assembly. The fire actually came to life June 2 as a 7-acre fire near Houston. State smokejumpers from Palmer helped curtail it at 60 acres. The next day, burning embers borne on 30 mph winds sparked spot fires. Crews stopped one, but another exploded in stands of dry black spruce and headed straight for Big Lake. Sandy Baker's family left Horseshoe Lake for Anchorage late and noticed a column of smoke on the horizon, but it didn't seem threatening. Ninety minutes later, as Baker got to Anchorage, a call came from a friend in Big Lake. Her parents were evacuating. "It was that fast," said Baker, who lives on the lake now. "So I felt a touch of panic then." Gamble knew right away that smoke column was trouble when he crested a rise on Beverly Lakes Road and saw the size of the fire ahead. "I said, 'This is not going to go well. It's gonna get out of hand in a hurry,'" he remembered this week. 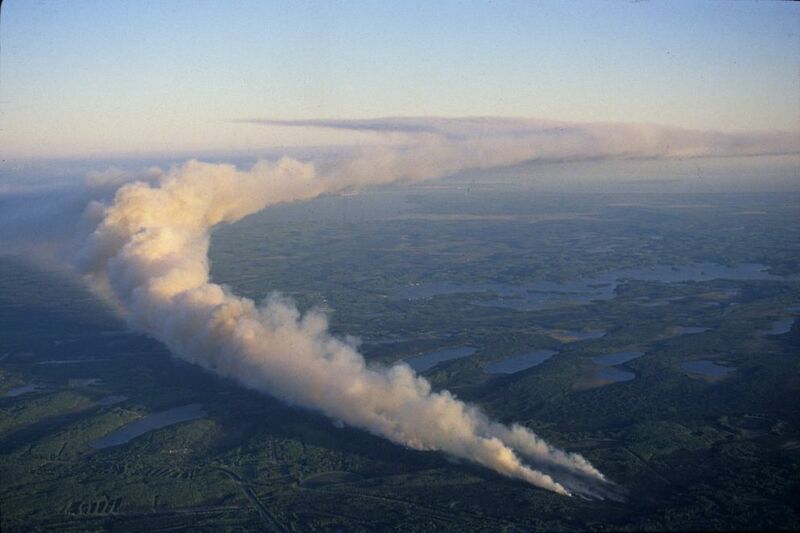 "At that point you could see 100- to 200-foot flames going across the Millers Reach area and the back side of Big Lake." Incident commanders from the Forestry Division advised state troopers to start evacuating people, according to an after-action review of the fire. The Red Cross opened an emergency shelter at Wasilla High School. Residents scrambled with little warning to grab possessions and go. Nancy Rogers and her husband took a boat and evacuated people trapped by the fire, Rogers wrote in a message. She's never found the woman on the north shore who threw her baby into Rogers' arms and begged the stranger to get the little boy to safety and leave her behind. "But we wouldn't," Rogers wrote. Stories of people staying behind — defying evacuation orders — or coming back as soon as they could to defend their properties and others' are abundant. Baker said she and a friend used a barge and a fire pump to douse hot spots whenever they saw them on Horseshoe Lake, even though everything but her outhouse had already burned. As residents stayed behind to protect property, a growing number of fire departments from around the region made a stand against the fire on Big Lake Road at Lucille Creek Drive. Gamble said his "scariest moment" came in those early days. Firefighters evacuating people and trying to protect homes just off West Lakes Boulevard encountered a sudden and potentially deadly fire shift. Gamble said commanders ordered the three trucks and about 15 firefighters to pull out immediately and then watched as a 10-story wall of flame converged on Beaver Lake Road — their only way out. "They came out of this cloud of smoke right as this huge wall of flame crossed the road," he said. "If they'd been another 30 seconds later, they would all have been burned." Ultimately, more than 1,500 firefighting personnel and 16 departments responded, including the Forestry Division and U.S. Forest Service. The fire burned hot for three days and wasn't totally contained until June 10 — eight days after it started. There were disagreements from the start. Local responders chafed at the call from forestry bosses to stand by at stations rather than fight the fire directly. Forestry commanders said that would have put structural crews in danger. Instead, local responders ended up handling a combination of evacuation and structure protection. Hundreds defied evacuation orders, including Iditarod champion dog musher Martin Buser, who became part of urban legend when he and a friend "liberated" an old fire tanker with a broken pump by driving it through the bay door of a fire station near Buser's West Lakes Boulevard property. As many as half the people inside the evacuation area stayed put, Gamble estimated. "The place was just smoking and we'd go back in there and out of the smoke we'd see people in their yards with hoses. We were just amazed nobody died in that fire." Responders saw the best and worst of people, he said. Some cheered and put up supportive signs. Others threw rocks and spit at firefighters for not protecting their homes. Some residents blamed the fire on the state commanders in charge at first. A Palmer jury later dismissed a civil lawsuit filed by residents who claimed state firefighters showed negligence. 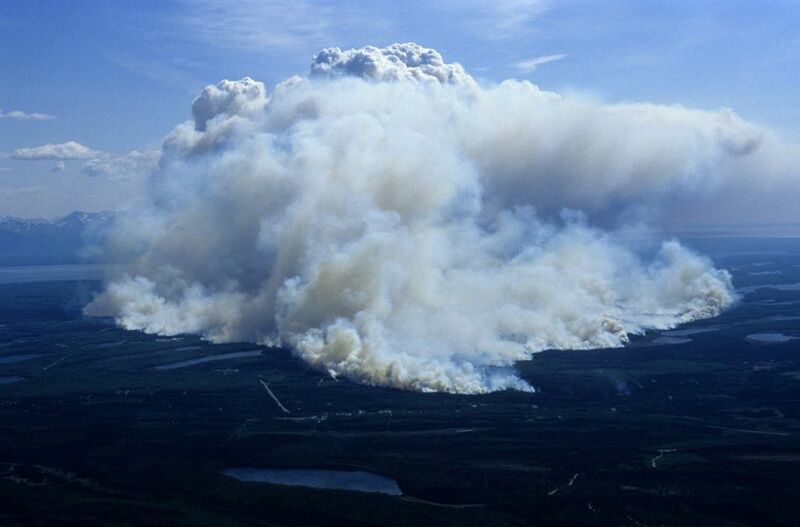 Millers Reach changed the way fire is fought in Alaska, emergency officials say. "The thing we learned from Millers Reach was that Alaska is really at risk on a broad scale," said John See, a retired Mat-Su state fire management officer who now serves as the Anchorage Fire Department's wildfire mitigation forester. Fire experts figured the Anchorage Hillside, Eagle River and parts of the Kenai Peninsula were at far greater risk than the flats around Big Lake and Houston, See said. "That fire sure changed a lot," he said. "I think just recognizing it could happen here to the extent that it did, losing over 400 structures — we never dreamed that was a possibility." In response, fire departments began training and equipping themselves to work with state wildland firefighters when fires sprang up in grass or forests near homes. Gamble said borough departments now work within the Division of Forestry's incident command system on wildland fires. But there's only so much local departments can do with funding and equipment constraints, officials say. Mayfield, the Assembly member, said Mat-Su isn't "even close to having a fully modernized, effective firefighting force." Borough fire departments still rely largely on paid, on-call responders working under a mandatory 29.9-hour cap every week. Gamble said that cap isn't likely to change any time soon. Last year's Sockeye fire that destroyed 55 homes in Willow sent Millers Reach veterans scrambling to pack their cars. "This should never happen again," Mayfield said, of such a destructive fire. "Of course, the Sockeye fire happened. That scared the bejesus out of us all." The homes around Horseshoe Lake in 2006 became part of Alaska's first "Firewise" community through a national program that encourages neighbors to reduce wildfire risk by clearing trees and brush from around homes, among other techniques. Firefighters are more likely to be able to protect homes with a "defensible space" buffer cleared around them. 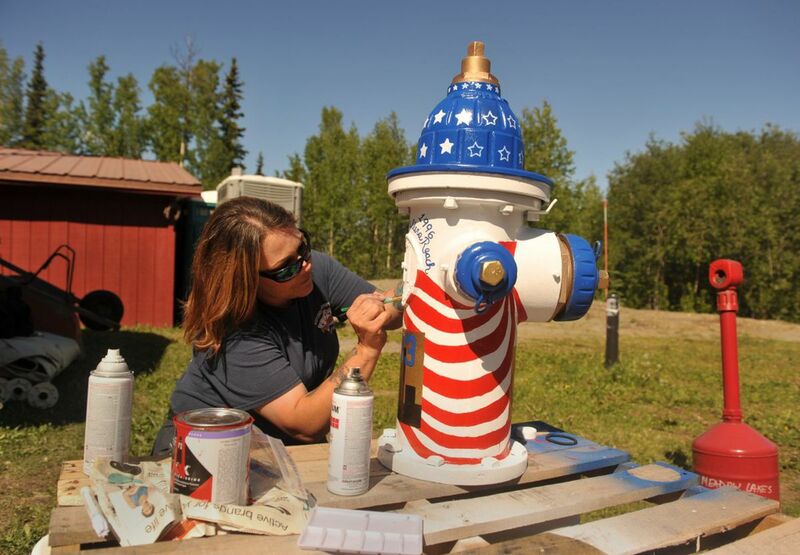 Cathi Kramer, the organizer of Saturday's block party, also coordinates the Horseshoe Lake Firewise program and serves on the local fire service area board. Kramer's family lost and rebuilt the house they'd planned to make their permanent home the summer of 1996. She remembered a moment from the fire: an assistant Big Lake fire chief, heartbroken at the destruction, told Kramer how helpless responders felt. This year, 45 West Lakes firefighters took pack tests to get red-card certifications that qualify them for wildland fire duty, Kramer said. "What a change," she said.